Now I know what two coin purses glued on to a wallet would look like - hell. Thanks to Maison Martin Margielam a brand I'm usually fond of, we now have the ultimate clutch. NOT! This thing is ugly, incomprehensible and about as fashion-forward as plaid retainers (don't laugh, I've seen them!). Although this over-priced dud is tauted as a clutch, I can't imagine the girl who'd be caught dead with it for a night out on the town. I'd prefer to douse it with gasoline, set it on fire and spread its' ashes to the four corners of the Earth. If you must know more about it, the Maison Martin Margiela Pockets Clutch has two coin purses attached to the outside of a wallet with snap closure and features several interior credit card slots, zippered pocket and money slits. It looks cheap, but, unfortunately, it's not. 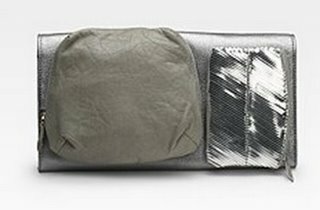 You can pre-order this silver hag bag for $795, but I'd prefer you wouldn't. Do as I say, pretty please?! ?